Shefford Town & Campton triumphed in their table-topping clash at Crawley Green Reserves to go six points clear in the Bedfordshire League. They won 3-1 at second placed Crawley to extend their advantage in the Premier Division supported by Sportsform. Jim Burnside, Kier Boyd and Ricky Young grabbed the goals against a lone home reply from Temitayo Akerele. This defeat saw Green drop down to fourth place below both Caldecote and Wilstead. Caldecote are now second after they retained their season’s 100% home record with a 4-0 victory over AFC Kempston Town & Bedford College. Two ahead via an own goal and a strike from Jack Boyd, they made sure of all three points when Tom Wallace netted twice in the last five minutes. Whilst Wilstead now find themselves in third after extending their unbeaten away run with a 1-1 draw at Flitwick Town. Hanvir Thiarra was on their scoresheet against a 90th minute home reply from Jack Colebourne. Fifth place now belongs to Wootton Blue Cross who won 4-3 at AFC Oakley M&DH to end the home side’s six game unbeaten run. Dale Armitage with a brace was joined on the Blue Cross scoresheet by Chris Butler and Sam Halfpenny against M&DH replies via Elijah Hukin twice and Alex Liburd once. Also netting four on the road were Cranfield United who still remain unbeaten away this season after a hat-trick from Josh Bamford and a penalty from Ali Smith took them to a 4-1 win at Renhold United. United go bottom after Queens Park Crescents notched their first win of the season when a penalty from Daniel Rasol took them to a 1-0 victory at Kempston Rovers Development. Also winning 1-0 were Ickwell & Old Warden, at home against Sharnbrook thanks to a last minute goal from Marko Tobzic. Marston Shelton Rovers picked up their first home point when sharing the spoils in a 1-1 draw with Stevington. Ahead in the seventh minute via a strike from Wes Burrows they were just four mintues from recording their first home win when Kieran Souter netted for the visitors. The new leaders of Division One supported by O’Neills are Totternhoe Reserves who retained their 100% home record with a 4-0 victory over the morning’s league leaders Wixams who were tasting defeat for the first time in seven outings. Lee Formont scored a hat-trick and Spencer Park joined him on the home scoresheet. This defeat dropping Wixams into third spot and overtaken by Riseley Sports who remain unbeaten on the road after winning 2-0 at Cranfield United Reserves. Jay Willett and James Jermyn both netted in the second half to earn the points. Still in fourth are AFC Kempston Town & Bedford College Reserves who were 4-1 home winners over Sandy. Kurtis Alleyne, Michael Sexton, Jonti Neal and Paul Obuch all found the back of the net against a lone reply from Max O’Keefe. Whilst now in fifth are Flitwick Town Reserves after they won 2-0 at bottom of the table Meltis Albion who were suffering their eighth consecutive defeat, Sean O’Donnell and Josh Arthur-Kent netting the goals to do the damage. Cople & Bedford SA are still looking for their first home win after being held to a 1-1 draw by Henlow. Ollie Hughes was on the home scoresheet and Paul Wright scored for Henlow. Biggleswade FC Reserves are still awaiting their first away win after drawing 2-2 at Shefford Town & Campton Reserves. Malcolm Marimirofa and Andrew Hayday marked the Town scoresheet against visiting replies via John Veal and Charlie Luff. With Renhold United Reserves sitting the afternoon out their place at the top of Division Two is now in the hands of Henlow following their 2-0 home win over AFC Oakley M&DH Reserves. Russell Ayles and James Campbell netted the goals. Bedford Albion missed their chance to climb into second spot when beaten 1-0 at Caldecote Reserves. Adam Legate scored the goal to end the Albion’s six game winning run. For fourth place Houghton Athletic it was a 4-1 away victory at Atletico Europa to end the home side’s unbeaten home record. Jordan Thomas with a hat-trick and a single strike from Mihail Tudos did the damage against a lone home reply from Yasmin Demir. Wilstead Reserves in fifth were the 5-2 home winners over Elstow Abbey. Gregory Turnball with a brace plus single strikes from Luke Prietzel, Luke Pursey and Robert Booth brought up the nap hand. The Abbey goals were the first and last of the afternoon via James Reynolds and Dean Leydon. Elsewhere Westoning lost their unbeaten away record when defeated 3-1 at Marston Shelton Rovers, Garry Russon, Carl Borromeo and George Rogers netting for the Rovers against a lone reply via Lewis Wilson. Sundon Park Rovers claimed their first win with a 3-1 home success over bottom side Luton Leagrave. Danny Buttigieg with a brace and a single strike from Nicky Buttigieg marked the home scoresheet against a lone reply from Matt McMillan. Wixams Wanderers were taking their unbeaten ways up to three games with a 3-0 home win over CS Rovers. Khy Cyrus, Jordan Benham and Daryl Oliver all found the back of the net. 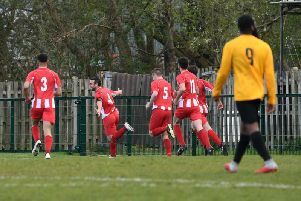 With leaders Kempston Athletic and second place Clifton both sitting the afternoon out Harlington took full advantage to move to overtake Clifton by winning 4-2 at Sandy Reserves to record their fourth win on the bounce. Shea Gentle-King with a hat-trick and a single goal from Liam John were replied to twice by Liam Brophy for the home side. Also winning on the road were both Caldecote A and Stevington Reserves. Caldecote A inflicted the sixth consecutive home defeat upon White Eagles with a 5-4 victory thanks to a hat-trick from Tony Norman and single strikes from Neil Giles and Luke Dear against Eagles replies via Andrij Zjablilev, Constanin Adrain David, Marchin Rogolski and Hincu Ion. Stevington Reserves won 3-2 at bottom of the table Wootton Village. First half strikes from Stefan Watts, Regan Scott and Daniel Coulthard fired them 3-0 ahead before, in the second period, the Village hit back with goals from Jack Flynn and Hamayun Shahid. Elsewhere there was a 5-4 home victory for AFC Kempston Town & Bedford College A over Lidlington United Sports. Michael Stephenson led the way with a hat-trick and joined on the Town scoresheet by Nikola Stanchev and John Hislop to bring up the nap hand against United replies via Nick Spencer, Carl Pearson, Brenden Cunningham and Danny Cain. Bedford Albion Reserves are now up into fourth and still unbeaten at home following their 4-1 home win over Flitwick Town A. Matt Phelan and Josh Emmerton both netted twice against a lone Town reply from Mark Bartlett.